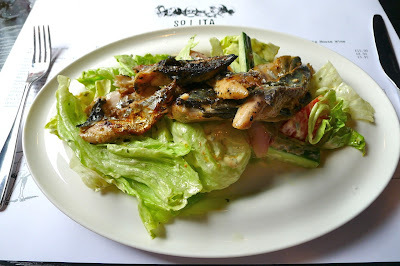 A couple of weeks ago, after visiting both a press lunch and a bloggers’ evening for a couple of free meals, I made a number disclaimers when posting about ‘the talk of the town’… SoLita (see here). 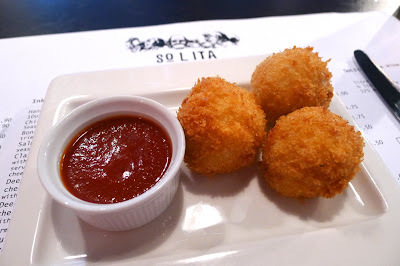 Anti-Disclaimer: since visiting SoLita as what some like to call a ‘freeloading blogger’ I, like many of my fellow ‘food obsessed’ blogging contemporaries have returned to SoLita and actually paid for a meal(s) out of my own hard earned cash… would you believe it?! In fact, over the course of the opening week, I returned three times (and have since travelled to Spain for a week of recovery and detox). 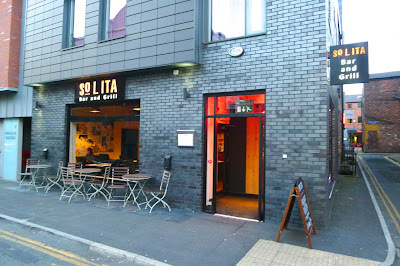 As mentioned in my previous post, the name SoLita refers to the restaurants location ‘south of Manchester’s little Italy’ but in Spanish also means ‘lonely girl’ and it’s been a lonely life sitting by and just able to follow the SoLita story on twitter - enviously eyeing the tweets from people; particularly the ‘cowboy steak’ tweeted by @DollyBakes. Admittedly, there were a couple of first week teething troubles but to their credit the SoLita staff have welcomed all constructive criticism. Olives & Things – I’ve had a side of these on each of my three visits, they seem to have trialled a couple of olive varieties and suppliers, but the Sicilian Nocerella Olives get my vote; especially when the ‘things’ include plump caper berries. 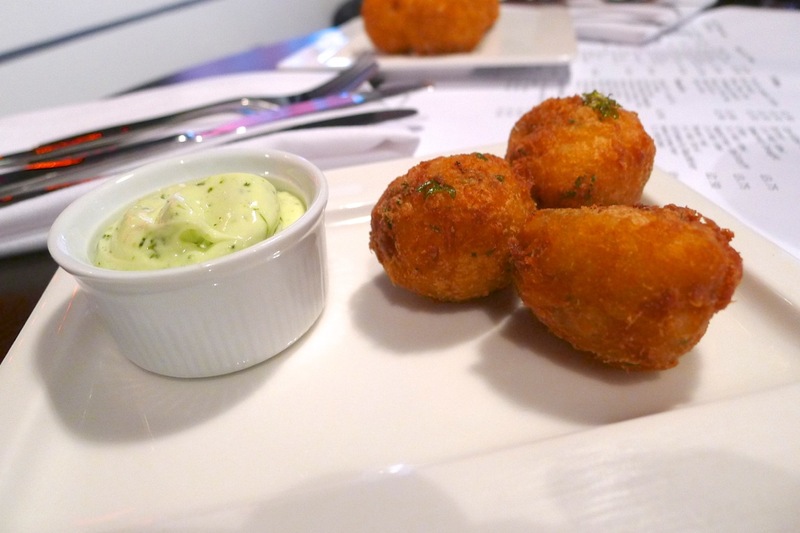 Salt Cod Balls with salsa verde mayo – these have been consistently good, well seasoned and well balanced. Mac ‘n’ Cheese Balls with homemade ketchup – I’ve just had these the once and liked them (I prefer the Salt Cod though). 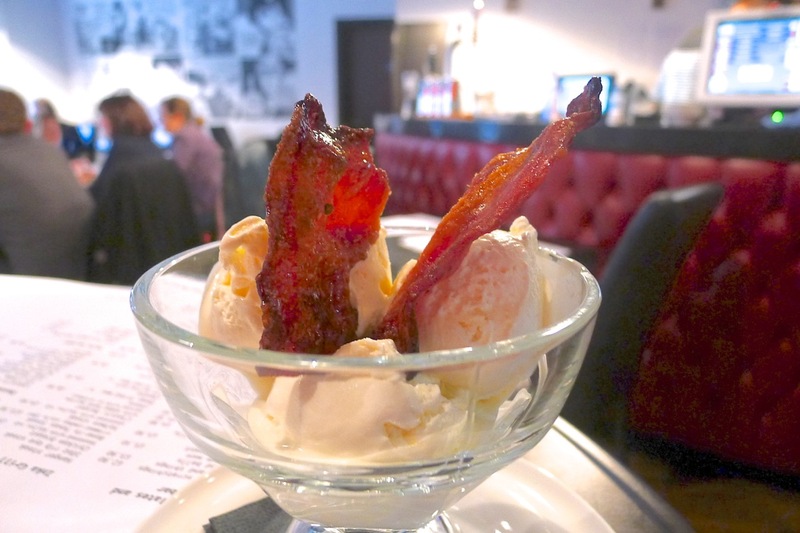 Pulled Pork Sundae – this dish continues to “Wow!” and bring a smile to my face. 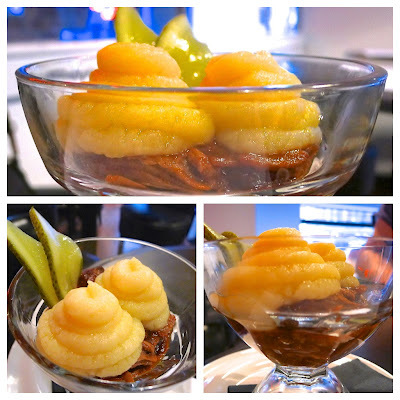 The most recent one was garnished with sliced gherkin as opposed to the usual scratchings – greedily, I suggest that both garnishes should be the way forward! All Star Hot Dog – I had this ‘Special’ on the opening night, with its smoked brisket chilli and zig-zag squirt of mustard, it certainly looks the business. Being picky, I’d like to see the brisket minced a little more coarsely but it certainly delivered on flavour with a good hit of umami. Inka Grilled Mackerel Salad – Mackerel is one of my favourite fish and grilled on the Inka it makes for a summery salad, reminding me of barbeques at home (a distant memory from when Manchester’s summers once permitted such activities). Inka Grilled Veg, Pecorino & Orzo – having tried much of the meaty treats on the menu, I thought I’d give one of the veggie options a whirl. Orzo is a particular favourite pasta of mine; a connoisseur may have said it was a little well done, lacking the prized ‘al dente’ texture – I found it to be a well conceived and tasty vegetarian option. Hanger Steak served with triple cooked chips – my recommendation to my wife on the opening night; Twitter informs me that the Hanger Steak has quickly become a SoLita favourite - the Inka grill seems to bing the best out of this cut of meat and it is keenly priced. My wife was certainly impressed. 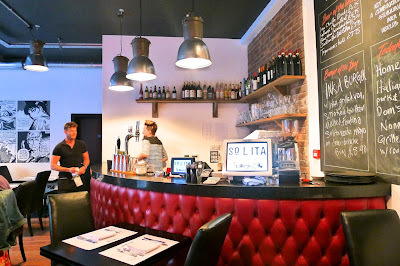 Côte de Bœuf – impressed as my wife was with the Hanger Steak, our second visit to SoLita coincided with a delivery from @frostybutcher; I asked him what was good and he mentioned that he had just dropped off some fantastic Côte de Bœuf set to be the evening’s special. Fortunately, I managed to twist the arm of Franco (Dom the Manager’s brother) who was on hand to hastily trim her one up. Not that I am complaining, but you can tell from the picture that this is not his day job but the erratic trimming did not affect the flavour (I’m guessing they were trimmed a little neater for the intended evening service). 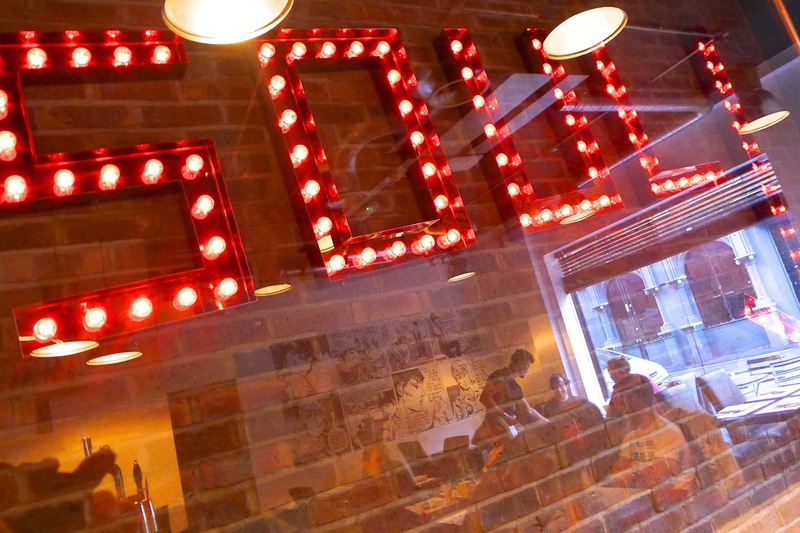 Classic Burger – there has been a bit of twitter banter* with the boys round the corner at Almost Famous about who produces the ‘Best Burger in Manchester’, (banter that resulted in Almost Famous referring to SoLita as ‘Italian twats’ but best not to mention their casual racism). Admittedly, I have not tasted the AF burger (having walked out unimpressed by their venue and attitude) but I know that SoLita’s chuck steak burger with added bone marrow for pure chin dribbling juiciness would take some beating! 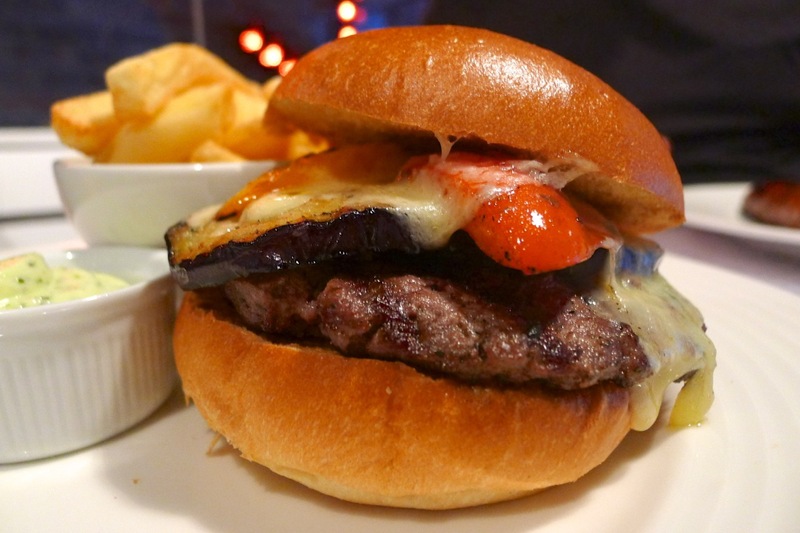 Pictured, a ‘Burger of the Day’ with Inka grilled veg, smoked butter, melted fontina cheese, SoLita verde mayo on a demi-brioche bun – damn near burger perfection! 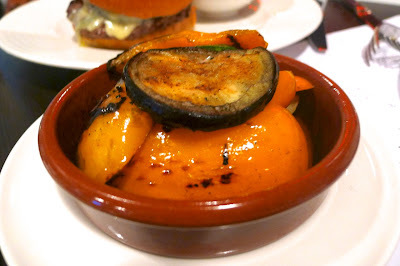 Inka Grilled Veg with smoked butter – this is another side dish that I have had on each of my last three visits. 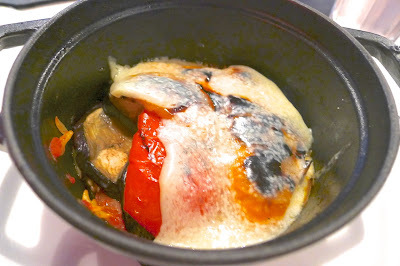 On one occasion (pictured), I felt the balance of veg was a little yellow pepper heavy… constructive criticism that SoLita seemed take on board for there was a good balance of peppers, courgette and aubergine on subsequent visits. It’s the smoked butter though that makes this side dish so special. 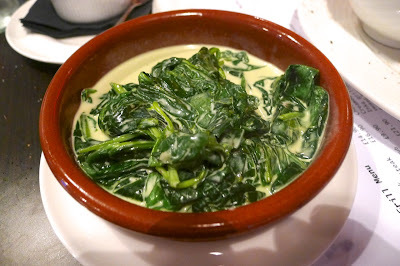 Creamed Spinach – my wife had this side and I was too busy chatting to taste it so can’t really comment; she enjoyed it though. I am pleased to report that, in my opinion, Cabrelli's ice-creams are not only local... they taste pretty good too! Wonderfully smooth and creamy with good vanilla flavour; I am also a convert to the quirky SoLita twist of bacon candy! 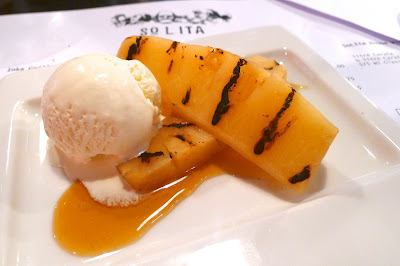 Inka Roasted Pineapple - marinated in Havana 7 and molasses, with Cabrelli's coconut ice cream on the side, this is a dessert that has caused me some problems. During the press lunch, it was perfect… for pure flavour, one of the best desserts I have had in a long time… I was in ecstasy. However, on opening night, I was disappointed – the pineapple was undercooked and lacked the depth of flavour; a real shame as I had been bigging it up to my wife (and indeed those who had read my blog). On the next visit it was better… but still not as good as the first time. 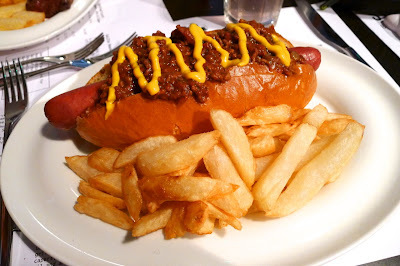 Like an ‘ecstasy’ user chasing that initial high, on my third visit I ordered another portion desperate to recapture the state of delight and elation… and bliss – it was back! Boom! I’ll be back soon too! Great post Hoss thanks for sharing. We visited for the first time on Thursday and it was a magic dining experience, haven't stopped banging on about it since. I'm pescatarian so had the salmon (amazing in the Inka!!) 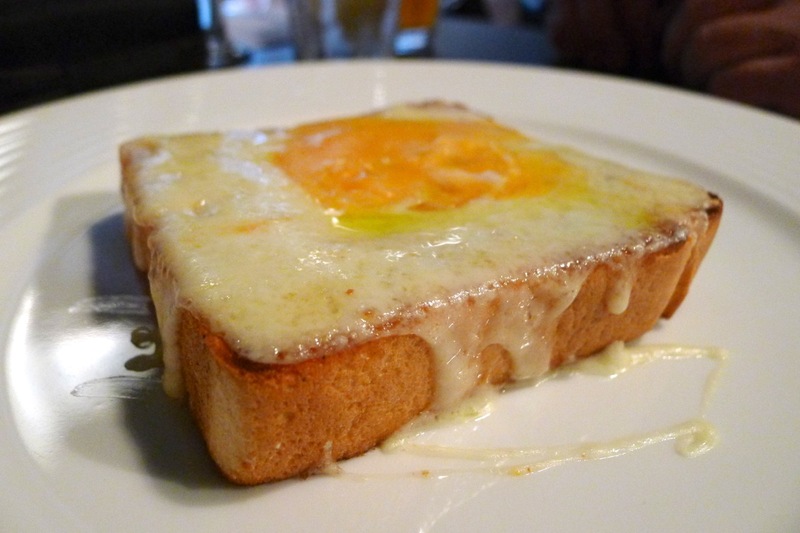 and the Uovo Pomodoro. 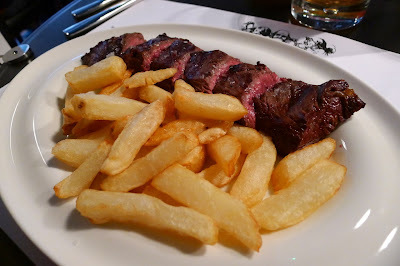 My boyfriend had the hangar steak and said it was seriously good - he said he wanted to shed a tear when he ate it! 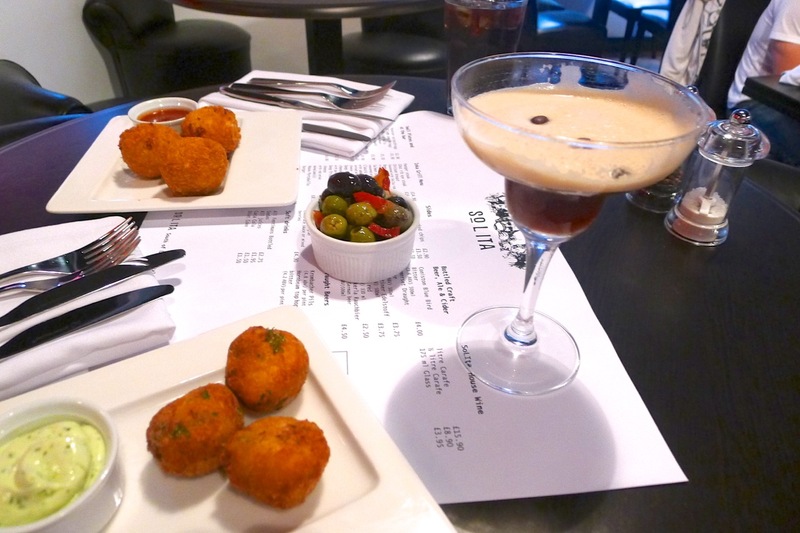 The pineapple dessert was lovely and the Deep Fried Coke too. One of the owners Tweeted about next week's specials and they sounded great plus they were very nice to me in particular telling me about the fish specials that I'll be able to have which also sound ace. 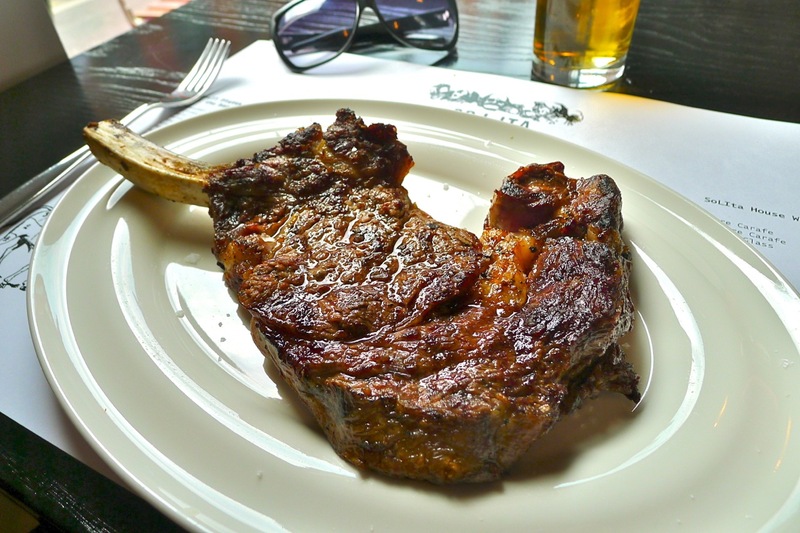 Great that for such a 'meaty' restaurant they've thought of dietary requirements which is more than we can say for the aforementioned Almost Famous with their quite rude attitude to vegetarians - pretty old fashioned when you consider the UK is 10% veggie now. I suppose that follows their attitude to pretty much everything though, including bloggers, women (I unfollowed them as fed up of sexist tweets) and now as you say people from other countries. Not that there's anything I could eat there even if I wanted to, I won't be visiting. Anyway sorry didn't mean for this to turn into an AF bashing! 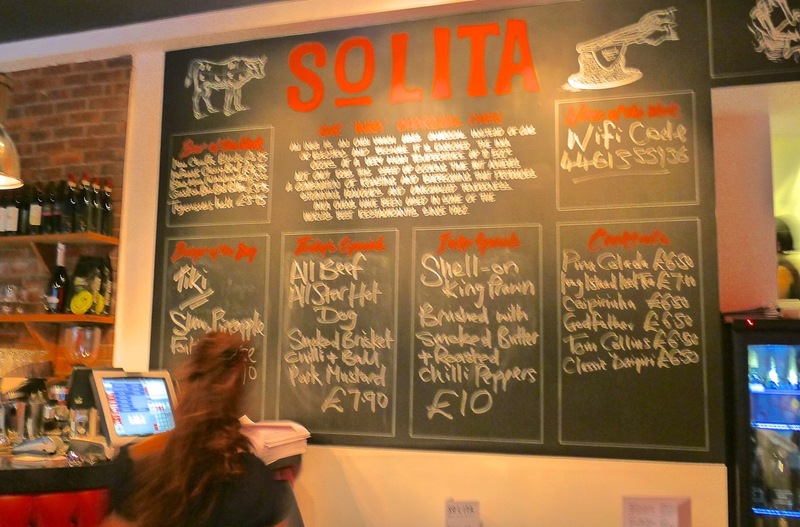 Look forward to reading more about what you eat at Solita next time! I've come to the party a bit late, but great post. I've heard mixed things about Solita but you've just swayed it to more positives than problems. I'll give it a go tonight. Although they do seem to lack many veggie options.